By now, we hope that you've all recovered from the glorious weekend that was Pride! 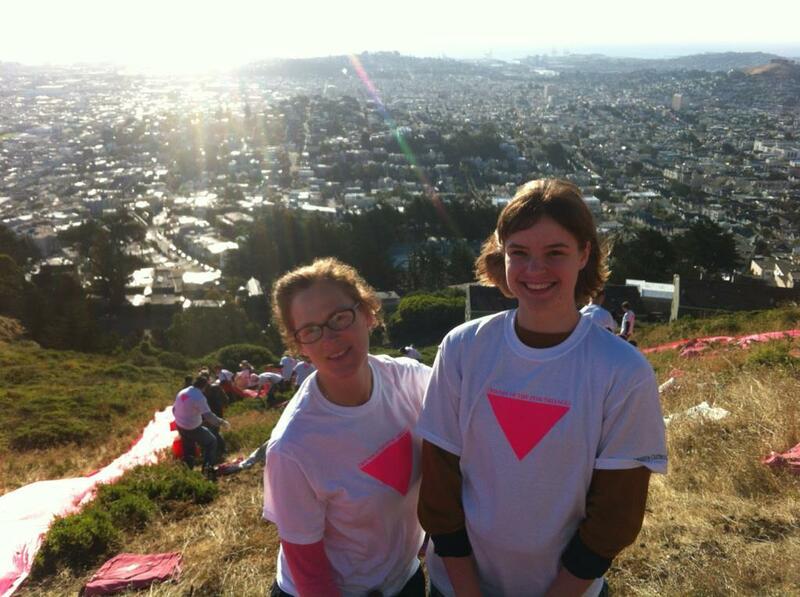 Thea's campaign kicked it off bright and early on the morning of Pink Saturday, heading up to Twin Peaks at 7 A.M. to help set up the Pink Triangle. The Pink Triangle has gone up for Pride weekend every year since 1995. Originally constructed under the cover of night to avoid police construction, it's now set up each year with the help of some 40-odd volunteers in the bright sunshine. Thea and Megan — armed with hammers, fueled with coffee and donuts. After the triangle went up (quite quickly, we might add, thanks to some good volunteer work and excellent organization), it was off to the rest of a normal campaigning Saturday. Thea and her dad swung by Patricia's Green in Hayes Valley for a start, then went to Alvord Lake in Golden Gate Park for its monthly cleanup, then to the Japan Day Festival in Japantown's Peace Plaza, and finally that evening to a play at the Buriel Clay Theater of the African American Art & Culture Complex. Whew! Sunday also started early, this time at the famous Alice B. Toklas Pride Breakfast. Hosted each year by the Alice B. Toklas LGBT Democratic Club, the breakfast is one of San Francisco preeminent LGBT political events. It's also tremendously fun — and the dim sum served is delicious! Thea and Kevin at the Pride Breakfast! Check out those colors. The parade as always was a huge hit, and some of us pitched in to march with the lively Obama contigent — we couldn't hand out "LGBT for Obama" stickers fast enough. All in all, it was a wonderful, bright weekend to celebrate diversity and community of every kind, and next year can't come soon enough. Last note: we're only 3 days away from our first crucial finance deadline. If you have not donated yet, right now is the time! Show your support for Thea. She's a working mom, a public transit advocate, and someone willing to wake up at the crack of dawn to hammer pink canvas into the side of Twin Peaks — what more could you want in a supervisor? DONATE TODAY!